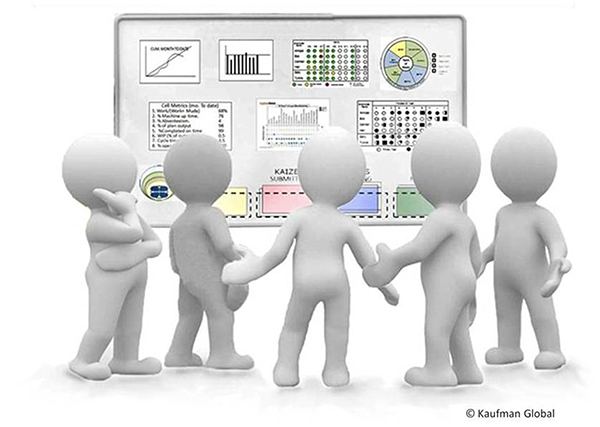 The Lean Daily Management System is Kaufman Global’s trademark methodology for workgroup performance. Our fundamental belief is that Lean is a people system. We created LDMS in the 90s to address a gap we saw between waste elimination tools and how to meaningfully connect people to their work. We wanted to compel the overall objective of Lean — maximizing customer value by minimizing waste — by enabling those at the very front lines to understand, control and improve their work every day. LDMS: A daily meeting at a primary visual display with metrics the work group can influence and control. The Lean Daily Management System is described by our clients as the critical success factor for sustainable operational excellence! LDMS is an implementation, not an installation. Even though they may want it, for many employees, greater autonomy and real accountability are foreign concepts. Our five week implementation sequence not only rolls out the components of LDMS to teams in a manageable way, we coach, teach and demonstrate best practices to ease the transition and ensure a solid foundation is in place to build on. Want to learn more? See our blog post: “Using Structure to Engage Employees and Optimize Value” or, download our Implementing Lean Manufacturing White Paper for more detailed descriptions of our methodology. LDMS sounds simple and maybe even easy to implement, right? IT’S NOT. You should talk to us if your seriously considering going to this next level of performance. We can help.